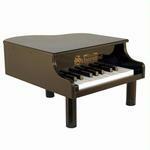 Schoenhut's® "Toddler-sized" piano is the perfect choice for introducing a young child to the world of music. 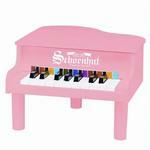 This smaller version, with its scaled-down keyboard, is designed specifically for little folks to have a first piano just the right size for them. Both fun and educational (and also extremely durable), it is the ideal instrument to promote eye-hand coordination and develop musical creativity. Small hammers strike metal rods, producing lovely chime-like tones, educating the ear of the young performer to the true values of musical notes and their combinations. Another point of merit is that the keys are the standard width of a full-sized piano, enabling the child to easily graduate to a larger piano. The Learning System, with its play-by-color assortment of songs, makes playing simple and fun. 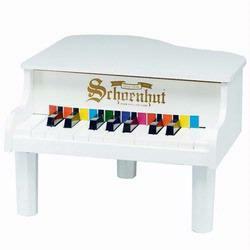 A removable color-coordinated strip fits behind the keys to guide small fingers from chord to chord. The corresponding Songbook contains a collection of familiar tunes.